A bitterly cold end to November which saw the start of preparations for this year's Santa Experience. 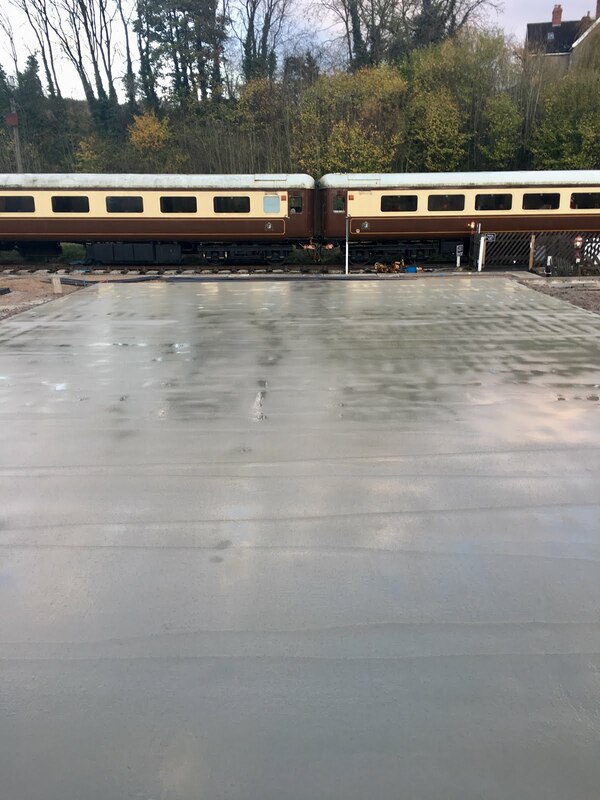 The Commercial Department erected the marquee on the platform and fortunately they managed to complete it with the contractors not laying tarmac on the platform until lunch time. 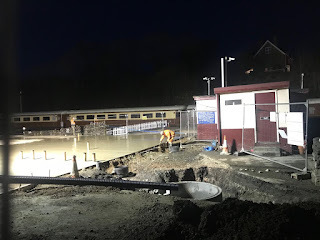 They had cut into the tarmac on the platform to put in some extra drainage due to a very high water table in the area. Tethering the marquee down for winter weather takes just as long as putting the thing up! Down the yard, the Santa train was marshalled, tested and delivered to the platform for the elves to begin decorating. LJ Breeze also received some attention as it was misbehaving earlier this week. The S&T team were in full swing down near the shed too. Tuesday is the steam teams day of gathering and Barclay No 3 was being prepared for a boiler inspection. Cathryn had cyclinder cladding fabricated, vacuum piping fitted and all copper work polished. We enjoyed four season's weather this afternoon down at Derbyshire's favourite branch line. It snowed, rained, sleeted and occasionally the sun shone through but generally a cold and wet day. However we still enjoyed surprisingly good visitor numbers as we progress towards our Santa Train season. 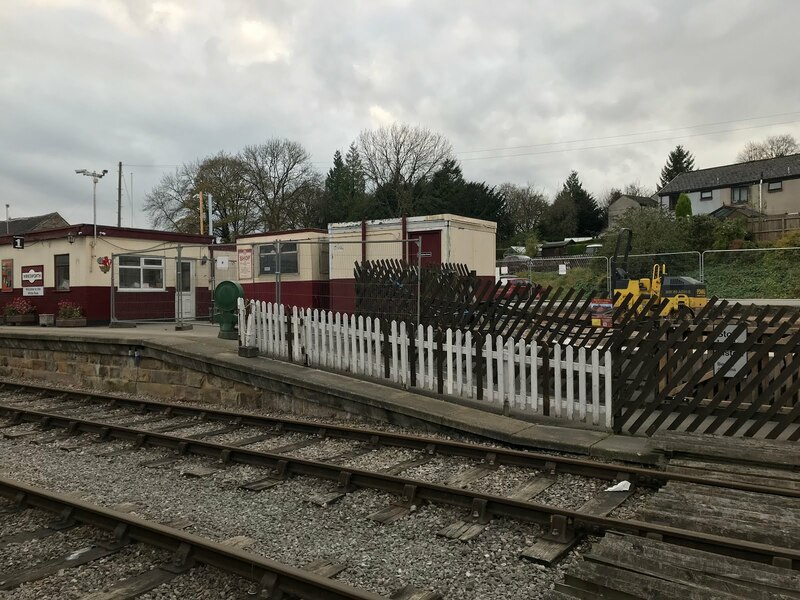 Unfortunately the 'Bubble Car' experienced a broken window in the guards van as it left Wirksworth Station and had to be taken out of service and replaced by Iris for the last two Duffield trips. The builders were in attendance today completing the laying of new electricity cables to the new build as were the LMSCA and DMU group working on their respective projects. 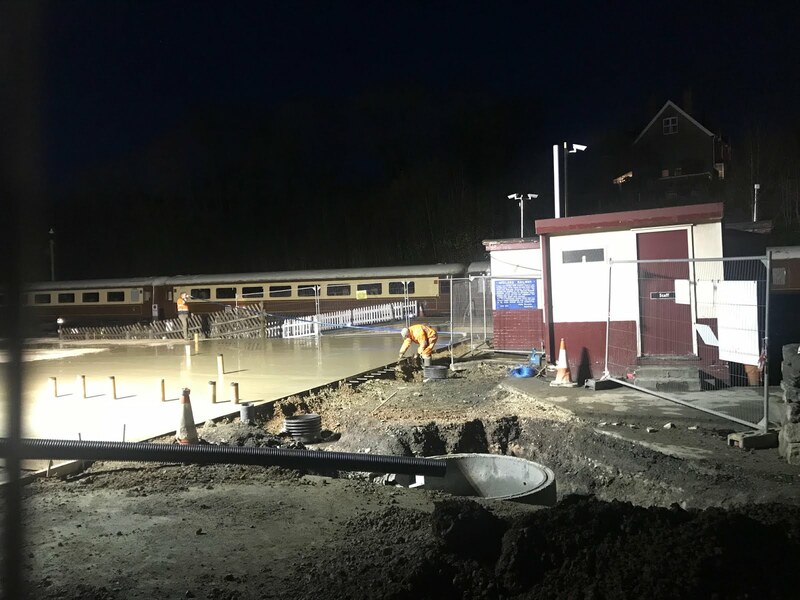 Wirksworth Station lights also received some maintenance to ensure our visitors enjoy well lit platforms and walk ways in the winter darkness. This evening there is a photo charter excursion to Shottle Station involving the class 31 and a rake of goods wagons. Thanks must go to Richard who was our third man. The weather was cold and miserable not to mention the difficulty wet steps cause third men when climbing up into Iris's guards van. Richard easily coped with these issues and still managed a yard tour together with playing host to our 'day with the driver' guest and family. Today's service was supported by our train crew, booking hall clerks and catering staff. A cold and crisp day saw a good turn out on the new S&T Dept where two new semaphore signals are nearly complete and ready for taking to Shottle. Nearby, the Maintenance Team were working in the 101 centre car cutting and gluing a new Formica panel for underneath one of the windows. One has been damaged recently. A team were also out and about battling with the track, which is never ending. It was all go on the building site today with the new piping for the service ducts being laid and the final concrete base being laid. Work was continuing after dark with big generator-powered floodlights. A quiet winter's day at Wirksworth. One member of the Miniature Railway team was pottering around and showing off his new branded up wheel barrow! Down the shed, the mechanical side of the Santa train examinations were completed and Derek was working on the BSK(K). 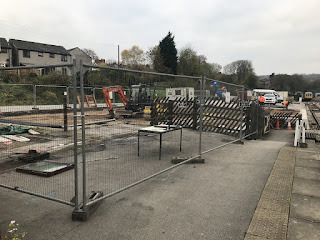 It is all go on the Station Building Project with the shuttering set up for the final concrete pad to be laid (probably tomorrow). This one has been more complicated because it includes all of the pipes for the toilets and sinks that will be in the building once it is erected. 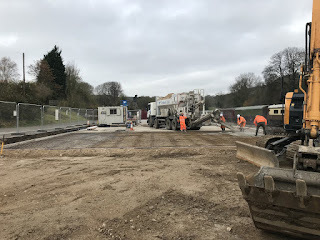 Those of you who have been recently will have also noticed the rather deep trench which stretches all the way from the site of the new building to the main gate. This is for the installation of new service ducting so that an upgraded electricity cable, bigger water pipe and hopefully town gas can be installed. This sub project includes 4 massive inspection chambers where an engineer can literally climb down inside to repair, add or upgrade the services in the future without having to dig up the driveway again. An 11 strong team of PWay turned out down the line which allowed them to split into two gangs, one changing sleepers and the other one working alongside a machine to improve the drainage. A cold day without trains saw a hive of activity inside the Maintenance Facility. The BSK(K) was having the doors fettles following on from reskinning the bodyside so that they fit properly, including new or repaired wood in places. On the next road, the recently arrived TSO was also having reskinning work with the new side panels fitted yesterday being painted to prevent surface rust. On the far road, painting preparation working including filling and sanding took place on the Class 33. Nestled at the back, Faraday was lifted at the other end for the axle box inspection which proved to be quite necessary. Getting it right first time should help to ensure reliable service in the end. A cold but dry day down at Derbyshire's favourite branch line attracted modest passenger numbers. Down the yard the LMSCA and the 48624 Locomotive Company held their respective annual meeting. A small number of the steam team were finalising preparations to 'Henry Ellison' for its trip to the North Yorkshire Moors Railway on Monday. Preparative work also took place on the signalling posts for the Shottle Loop. Santa bookings continued today and well done to Robert who booked a party of 47 girl guides on one of our Santa Trains! At Wirksworth Station Ron and young Kyle spent time clearing the leaves off the miniature railway. Today, our catering team provided our volunteers with a free buffet as a token of thanks from the Wyvern Rail Board for all the hard work that has taken place throughout the year. Eric, Helen and Anne laid on some lovely delights and the event was well attended. Incidentally, 'Trish has made some great Christmas Cards and key rings of summers steam scenes which are great quality and well worth the price. Ideal stocking fillers. Today's train service was supported by the booking hall staff and Pullman Buffet catering team not to mention our 'senior' train crew who looked after our passengers splendidly. Not quite so busy today but we did host a Bronze Drive a Diesel experience this morning with the Bubblecar doing the honours this morning and the Class 31 this afternoon. It was nice to see the Class 31 have a run out after a few weeks of inactivity. The Maintenance Facility received a shunt to reposition vehicles, with the recently arrived Mk1 4440 going in temporarily to have new body skins welded on. The Maintenance Team reported that the majority of their exam work was completed with only a few bits and bobs outstanding. Much more hip and happening at Wirksworth today with quite a good turn out for the new S&T gang who are constructing the signalling equipment for Shottle. Remember we didn't inherit anything really so everything is either having to be sourced or fabricated from scratch. The signals will eventually be operated from the former Oddingley box. The Maintenance Team were able to split in two today with one successfully fitting and testing a 'new' heater to 50253, completing that vehicle with a most important component for the Santa Season. The other team continued with work identified on 50170, changing a radiator fan. Derek and Dan continued with the bodyside work on the BSK(K). David Newby came to the rescue with a sudden issue that manifested itself in the Gents. Some toilets filled, some didn't! Fortunately he was flushed with success and all is good again for Saturday's trains. Oh the fun we get up to! Very quiet at Wirksworth today although the PWay team did well with their sleeper changing down near Hazelwood. The Maintenance Team cracked on with the Santa train exams and ticked most things off the list today so just pending jobs found to be carried out. The contractors started pouring the concrete for the second pad on the new station building project. Pic attached. Work commenced on A exams on Both the Met Camm centre car and 50170 completing the trio for the Santa Train. We expect a great deal from these 60 year old vehicles which run non stop on the Santa trains from early morning until dusk for nine days !! With no scheduled passenger trains on Sundays in November, attention really does turn to the Maintenance Facility and the various projects going on down there. I would imagine that they're already praising the roller shutter doors that were fitted this year as the temperature today really was low. Whilst the inside isn't heated, they will do a good job of keeping the wind out. There was one group working outside though and for that I am sure they're grateful that it was sunny. The structural framework on TSO 4440 is being renewed gradually with a view to getting the coach water tight, although this is some way off. Team Faraday were in full swing inside though with the bearing being refitted and the locomotive being lowered down. The locomotive had obviously ran a hot box at some time in the dim and distant past and this has had to have new white metal. The other end of the loco will now be lifted up to remove and clean out the axle boxes there because the oil ways from the lubrication system seem to be blocked which will prevent proper lubrication in service and create problems further down the line. It shouldn't take so long to rectify this though. The BSK(K) which is also receiving structural repairs now has the new body side sheeting fitted and excellent it looks too. Across the in the old part of the facility, work continued on the repaint of 33103 "Swordfish" with the old paint being sanded down. So far, the body work is in better condition than expected. Henry Ellison was steamed up today too for testing purposes and I suspect they were the warmest on the railway! It is quiet now being November with not so many volunteers being on site at Wirksworth. Yesterday though, the exam on 50253 was completed and this car is now ready for Santa service after it has had an interior clean. The rest of the set will follow on the exam line next week although the exams for these cars are smaller. 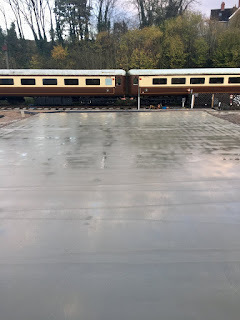 Work has been continuing quietly in the shed on both the EVRA CK coach which is now nearing completion and will look a lovely coach when it runs next season, as well as the BSK(K). Also continuing quietly in the background, in fact at an off-site location, one of the Derby Lightweight's AEC 220 engines is having a strip down and rebuild ready to be refitted. Today we hosted a small team from Network Rail who were on a team building day. They split into two teams with one cleaning the inside of the rest of the Santa train and the other tripping down the line to do some vegetation clearance in the vicinity of Shottle. This will be most useful for the upcoming photo charter with the Class 31 in a few weeks time. You may wonder why I do not send out a progress report for Wednesdays. It is simple other than the PWay working down the track on one of their usual tasks there was only myself Leigh and the apprentice who was washing the Santa train. The Pway team continued sleeper changing and our Civil Engineering Manager walked sections of the line but I am sure he had wished he had picked another day !! It was a quieter day at Derbyshire's favourite branch line with many volunteers visiting events at other heritage railways. The bubble car ably dealt with todays passenger numbers. 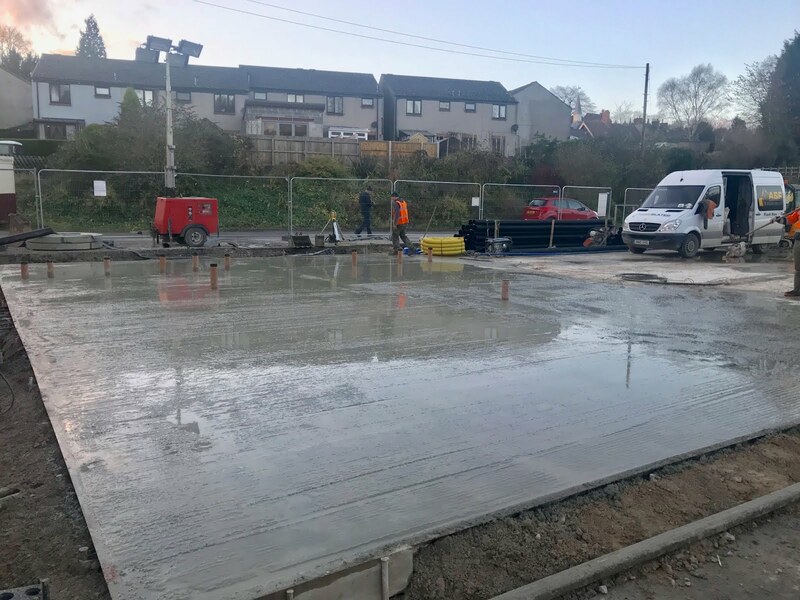 Work on the new station building continues at a pace with concrete being poured into the first section. Up in the town EVRA held its Annual General Meeting to a packed audience and back at base, the Catering Team hosted a party of visitors before they enjoyed a trip along the valley. The miniature railway team were also in attendance. Todays service was supported by the Pullman Buffet and Booking Hall staff. All in all a pleasant autumn day. Well, I said the view would change and it has. The EVRA shop and Info Room have been temporarily moved out of position to allow construction of the base for the new building to continue in that area. Photo attached. We hosted a charter today for a local care home who had a ride down the line in 55006. They had a thoroughly enjoyable time. Quite a mad house for a random day in November with no trains running. We welcomed a MyTestTrack customer who had a RRV with trailers and weights to do some 1530 testing. It was a small but nifty machine. Down the yard, the B exam on 50253 was completed and work continued on the metal work on newly arrived coach 4440. The Station Building project moved forward with the deconstruction of the EVRA shop ramp and emptying of the Information Room. The builders fencing was then erected for work to start shortly - maybe tomorrow! 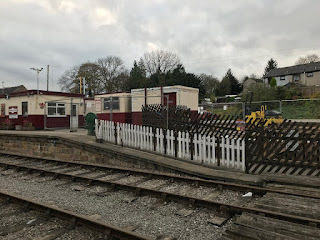 Attached is a photo of the view, one which has been commonplace at Wirksworth Station for a while but is soon to be extinct. 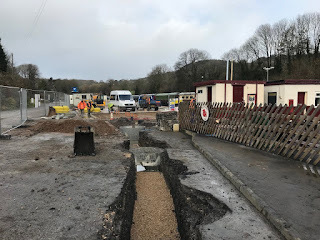 It has actually been quite handy having a contractor on site because a water leak had developed in the old 1860's pipe which feeds the station along the driveway but the contractor dug it up, found the offending crack and repaired it quickly saving loss of expensive metered water.